Until recently, surgery for most gynecologic conditions was performed using a large abdominal incision. 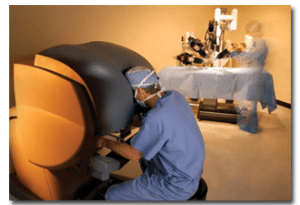 This is because while conventional laparoscopic surgery is effective for many routine procedures, the long-handled, rigid instruments used in laparoscopy are not usually considered effective for delicate or complex operations. Fortunately, there is a minimally invasive option for treating gynecologic conditions designed to overcome the limits of traditional open and laparoscopic surgery –da Vinci Surgery. 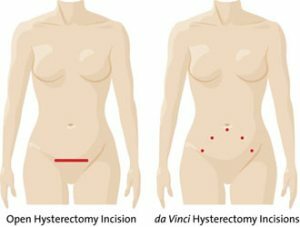 If your doctor recommends a hysterectomy to treat your condition, you may be a candidate for da Vinci Surgery. Using state-of-the-arttechnology, a da Vinci® Hysterectomy requires only a few tiny incisions, so you can get back to your life faster. The da Vinci System is a state-of-the-art surgical platform with 3D, high-definition vision and miniaturized, wristed surgical instruments designed to help doctors take surgery beyond the limits of the human hand. By helping doctors to overcome the challenges of traditional open and laparoscopic surgery, da Vinci is changing the experience of surgery for women around the world. If you have been told you need a hysterectomy, it’s time to ask your doctor about da Vinci Surgery. Learn why da Vinci Hysterectomy may be your best treatment option for a range of gynecologic conditions. As with any surgery, these benefits cannot be guaranteed since surgery is specific to each patient, condition and procedure. It is important to talk to your doctor about all treatment options, including the risks and benefits. This information can help you to make the best decision for your situation. Bell MC, Torgerson J, Seshadri-Kreaden U, Suttle AW, Hunt S. Comparison of outcomes and cost for endometrial cancer staging via traditional laparotomy, standard laparoscopy and robotic tech Gynecol Oncol. 2008 Dec;111(3):407-11. Epub 2008 Oct 1.